Your kiddo's name is incorporated into a colorful story of heroic adventures both big and small. He lifts doughnut trucks in danger with his super strength, and takes on evil stuffed animals with a wham! and a pow! He's Mega Dad. 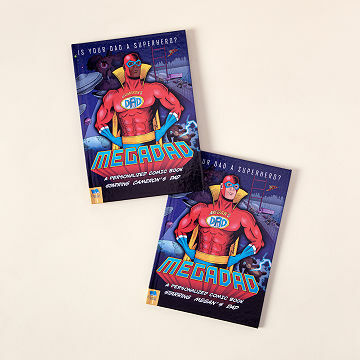 This custom hard-cover comic book incorporates your kid's name and Mega Dad into a colorful story of heroic adventures both big and small. A fun addition to reading time, it makes a dynamite gift from child to parent, or for a new dad. Made in the UK. Where is the Dad part??? The concept of this book sounded great, however, the book was not very good. The name of the book is Mega Dad, but the Dad's name is barely mentioned. Dad's name is noted on one page in the beginning but that's all! Our son's name was mentioned in the book in a kind of random way but the book is supposed to be about Dad. We were sadly disappointed especially for a Christmas gift. I would Not recommend it. I got this for my Dad who raised me on comic books. He has always been my best friend, and this was the perfect gift to encapsulate the bond we have. When he received it, he loved it so much he cried. It's not just a book for him, it's a book for us. The quality and binding are great. I would totally buy this again and recommend it! We are huge comic book fans so this is totally awesome gift! Looks like a real comic book. Wonderfully crafted. Excellent product.